Most of us are captivated by waterfalls. Is it the peacefulness of the rush of running water, or the beauty of the amazing sight? Maybe it’s the awesomeness of the sheer power of the water propelling over the edge that fascinates us. Whatever the reason, many of us seek out waterfalls when we travel. 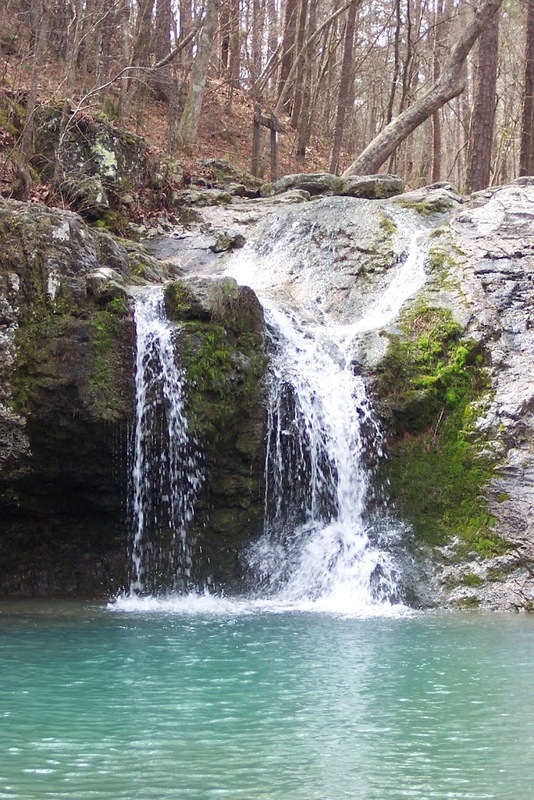 One of the most photographed Arkansas waterfalls is located on the edge of Hot Springs in Lake Catherine State Park. To reach Falls Creek Falls, stop at the visitors center near the State Park entrance and get a map of hiking trails. Proceed on to the trail head located just off the lake shore, near Remmel Dam. The Falls Branch Trail starts in a wooded area, and gradually proceeds uphill (be sure you’ve worn sturdy hiking shoes – some parts of the trail may be wet). As you climb, notice the novaculite – a stone often found in the Ouachita Mountains. Novaculite is mined almost exclusively in the Hot Springs area for whetstones, used in knife sharpening. As you continue on the trail, you will be following a small creek. Once you reach the top of the hill, you can hear the falls getting closer. Finally you reach the top of the falls! Steps will lead you down to the blue green pool at the bottom, and great photo ops. Bring a picnic lunch and enjoy the serenity of the falls for a while. When you’re ready to head back, continue on the trail, as it passes the shore of Lake Catherine. The end of the trail treats you to a large swinging bridge surrounded by Bald Cypress trees! If you don’t have time for the entire 2 mile hike, you can follow the trail backwards (clockwise) along the lakeshore and to the foot of the falls and then turn around and go back. (About 1.5 miles total). If you want to make a day of it, stop at Garvan Woodland Gardens on your way back and enjoy even more hiking, nature, and waterfalls. The weather is cooling off, and we’ve received some rain recently, so make your stay at Tiffany’s Bed and Breakfast even more memorable with a hike to Falls Creek Falls.